Hanging Fish Tank is a better option compared to fish bowls because it can hold higher volume of water (20 – 50 gallon tank size) and offers much larger living space for your fish. Nowadays there are different manufacturers that can provide these custom-made tanks and it comes with high cost for installation, most of the time reaching few thousands. Unlike hanging fish bowls, which can be easily setup within minutes, fish tank requires assistance of expert builders to ensure proper drilling and installation of the studs so that the mounting can support the heavy load. 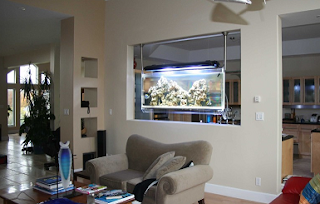 Basically there are two different types of hanging fish tank setup whereby it can be either dangling from the ceiling with support rod or wall-mounted to suit the requirements and preferences. The dangling type as depicted in the image above, looks stunning in the sense that you can view the fish from both sides of the aquarium. However, since the fish is exposed from all corners, it is imperative that you must provide proper hiding place so that they won’t easily get frightened. The wall-mounted setup is much simpler and basically it blends in like a normal wall painting with some actually made to look like it is embedded in the wall itself. Most of the hanging fish tanks sold in aquarium stores and online suppliers come complete with fluorescent lights coupled with hidden aquarium filter. These setups can be made to house either freshwater or even saltwater fish of different sizes since living space is not a limitation. Perhaps one of the most attractive examples of hanging tanks are those specially made for arowana and discus fish. There are even aquarium concepts created to combine different species of fish to form a community tank based on tropical waters natural ecosystem. Whichever your choice and preferences, the number of combination are endless.